Valeant Pharmaceuticals had its annual shareholder meeting in Leval, Canada on Tuesday and, as is custom, after the company’s presentation the floor was opened up to questions from shareholders. The shareholders, few though they were, came impressively prepared. They asked tough questions that new CEO Joe Papa was forced to skirt in typical smooth CEO fashion. They asked about why they hadn’t heard more about the scandal that brought Valeant’s stock careening down 90% since October. They asked questions about the company’s accounting and its issues with regulators over its drug pricing practices. Papa’s responses to them were canned at the very best. After platitudes about how Walgreen’s has been a “good partner so far” to the company, and after praising Valeant’s product line and a reframed commitment to its R&D pipeline, it seemed like Papa is still a little stumped about what’s next for the company. But first, lets talk about the presentation. There were two big takeaways there. 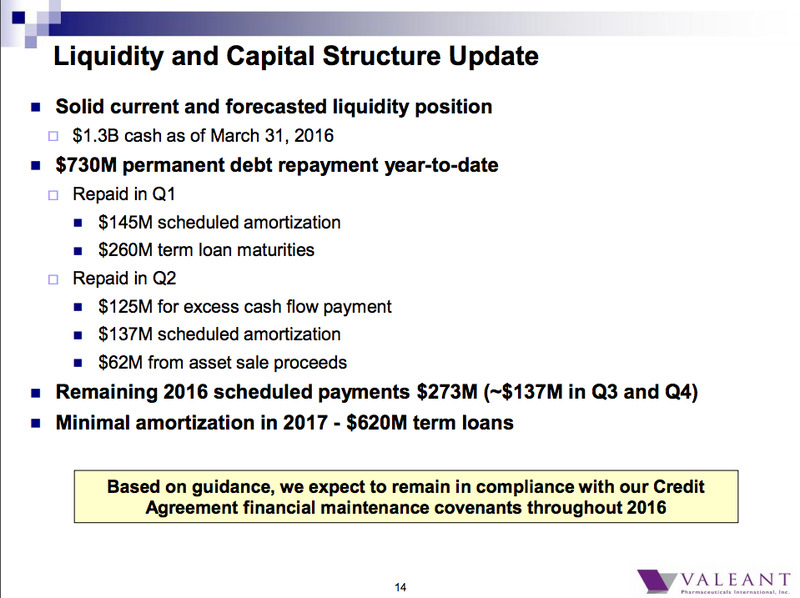 The first was that Valeant is going to try to pay down a ton of debt, and fast. The company plans to use $1.7 billion to do so in 2016. Papa said debt reduction is “important to the future of the company,” which jibes with the Bloomberg report that Valeant just contracted Morgan Stanley to help it sell some of its dermatology assets. Papa didn’t rule out selling more assets either, but he’s walking a fine line. The company’s projected earnings for 2016 of $4.8-$4.95 billion already put it in danger of falling below thresh holds it has to meet in order to comply with creditor agreements. The other big issue in the presentation was Xifaxin. It’s a drug used to treat irritable bowel syndrome (IBS) that Valeant projected would be a $1 billion product this year. Well, it looks like it’s not going to, and Papa is focused on ramping up its sale to the 10%-15% of American adults who suffer from IBS and other gastro issues it treats. No plan was laid out for doing that, but one thing is for sure, it’s going to cost money. Now for the questions. There weren’t many, but they were of pretty high quality. 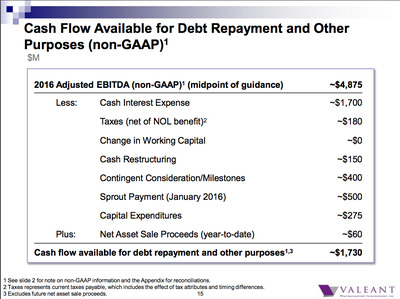 For example, right out of the gate, the first shareholder asked about how much goodwill Valeant has on its books. Goodwill is a measure of intangible assets a business collects after making an acquisition. Papa didn’t seem to know the answer to this at first, but then a member of his staff said the company had $18.5 billion in goodwill on the books. 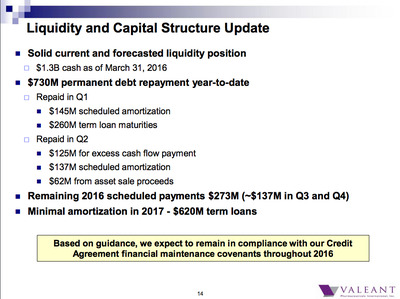 Valeant has an $8 billion market cap. Makes you wonder exactly what all that goodwill means (or meant) in the first place. The next question from a shareholder is key. He’s a dermatologist who sells Valeant products. He said that he thinks the problem with the Walgreen’s deal, which Papa admits is off to a bumpy start, isn’t really Walgreen’s. It’s the insurers. “We need to address the insurance issue. I think that’s what blocks it and prevents my patients from getting products on a more timely basis,” he said. Papa didn’t really have answers for that. Part of the issue is that Valeant’s scandals frayed the company’s relationships with insurers and healthcare providers. S0me severed their relationships with Valeant when it was found that the company was using a now-defunct private privacy to trick insurers into paying for Valeant drugs outside their client’s offerings. Repairing those relationships is going to to take time, and Valeant needs cash now. Papa also got a question about why shareholders don’t know more about what’s going on with Valeant’s price hiking problems and the rest of the scandal that took place this fall. Papa didn’t answer that. One angry shareholder asked why former CEO Michael Pearson, who presided over Valeant’s near-demise, got a $9 million pay package. Papa said that it was in his contract, but failed to discuss the fact that Valeant is retaining Pearson as a consultant for two years along with perks like paying for his travel, health insurance, and office. Lastly, Papa skirted a question about Valeant’s changing business model. 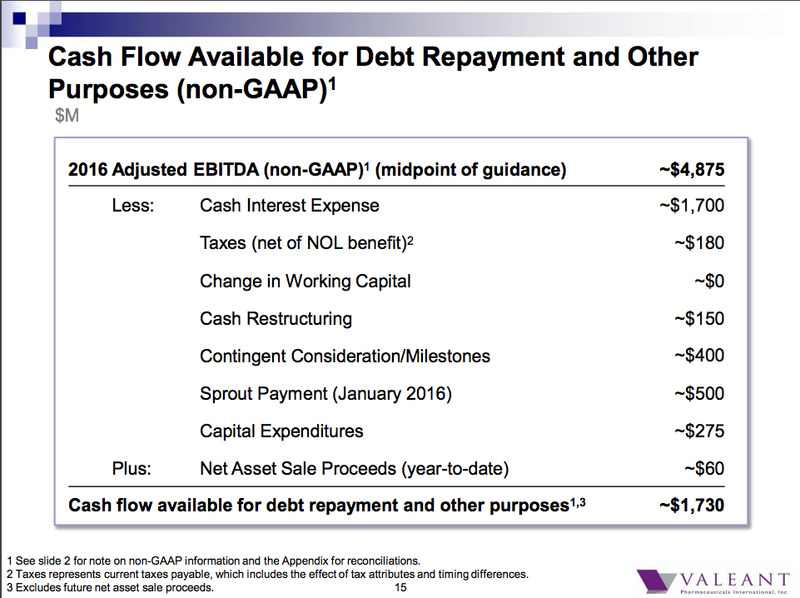 A shareholder asked if Valeant’s seemingly new-found focus on R&D was a new business model. Papa said simply that the company doesn’t focus on how much it spends on R&D, just how productive that R&D is. Plus it doesn’t have the cash, lets be real. It doesn’t have the cash (or the ability, thanks to its creditor agreements) to go back to growing through acquisitions either. Eventually (after who knows how many asset sales and legal issues) this will all be over, and Valeant will have to be something — the question is what. You can see why Papa is stumped.